Brimful Curiosities: My Poetry Book Kids' Poetry Challenge - Week 1 - "The Fairy Dew Drop"
My Poetry Book Kids' Poetry Challenge - Week 1 - "The Fairy Dew Drop"
Welcome to the first of five "My Poetry Book" Kids' Poetry Challenge post link-ups! In celebration of National Poetry month, we're challenging other parents and kids to explore the world of poetry together. We've tried to make it very simple for everyone to participate. Reading a poem together only takes a few minutes. The link-up will remain open all week long, so feel free to post the picture and accompanying text any day of the week and, if you have the time, stop by and visit the other participants' posts. And vanished from my sight. The poem is from a slim volume of poems titled, Laura Ingalls Wilder's Fairy Poems , compiled by Stephen W. Hines and illustrated by Richard Hull. I never realized that Laura Ingalls Wilder had written anything but the Little House books, so her fairy poems came as a bit of a surprise to me. According to the introductory chapter by Hines, Wilder wrote articles for various newspapers before she wrote her books, and she wrote the fairy poems for the San Francisco Bulletin. 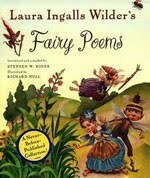 Only five short poems appear in Laura Ingalls Wilder's Fairy Poems. 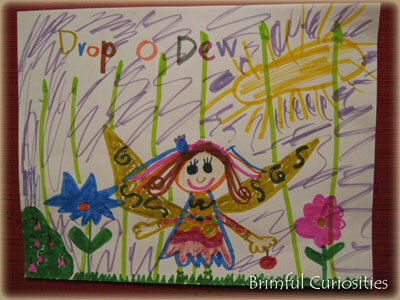 My daughter chose to illustrate the first poem, "The Fairy Dew Drop," a poem about a fairy named Drop O'Dew who takes care of flowers. The quaint, happy poems are all simple enough for young children to cherish and a refreshing alternative to the Disney Fairies kingdom. Interestingly enough, Wilder's poems were all written in 1915, after Barrie's Peter Pan but before the Cottingley Fairies photographs and Cicely Mary Barker's popular flower fairies illustrations. Even with her poetry, she was, in a sense, a pioneer. I'm linking up to Poetry Friday! This week's Poetry Friday is hosted by Amy at The Poem Farm. 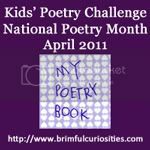 Head over to her blog for more poetry posts and consider joining the Poetry Friday link-up. Wonderful :) Your daughter is very talented! That's an adorable drawing! I hadn't heard of this book. Thanks for the challenge. I love your daughter's drawing! We plan to participate in your challenge and will be linking in the near future. I think it is such a neat coincidence that one of my daughters and I just discovered this same book of fairy poems the other day in our library system's catalog, and we placed a hold on it! I also had never before known that Laura Ingalls Wilder wrote poetry. I am curious to take a look through it. Wow I hadn't seen that poetry book before, either. Thanks so much for posting this! I will try to get my son's to participate in this link up this week. Look like fun! I had no idea she wrote poetry - and about fairies no less! I love your daughter's artwork - so colorful! love the picture and learning for sure.. Have a great weekend.. This is a new book to many of us, seems! I can't wait to tell our children that Laura wrote poems too! Maybe we'll even link up and try drawing along. Lovely picture by your own daughter...so joyful! A. Her drawing is beautiful! I would so be framing that one! I had no idea Laura Ingalls Wilder wrote poetry! We will have to look for these fairy poems. Your daughter's drawing is beautiful! Very nice drawing, and I also didn't know about Ingalls Wilder's poetry. I think the picture really reflected a poem. Thanks so much for bringing Laura's poetry to our attention! I love it when bloggers share rare finds like this one! Thanks again. I'm another one who didn't know LIW had written any poetry - what a great discovery. Thankyou! janelle, we finally picked this book up and loved it! thanks for sharing! !